Happy Summer! This is Tarah I originally posted this recipe for Mediterranean Green Beans with Golden Raisins on my recipe blog, What I Gather. You can view the original post on my blog, along with my other fresh, nutritious recipes, or simply read on to see the full recipe. I have to assume that if you are growing green beans in your own backyard, you probably already enjoy them. I, on the other hand, wouldn’t touch a green bean until recently, but I’m glad I finally realized what I was missing. We didn’t grow our own green beans this year, but we picked some up at the farmers market and it was fun coming up with a new and unique way to use them. 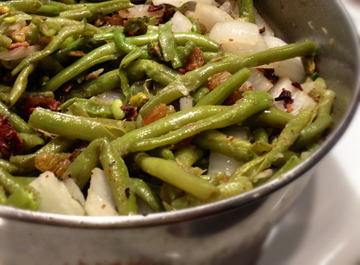 This dish uses spices, golden raisins and pistachios to add a Mediterranean flair to these tasty little string beans. Enjoy! -Bring a large pot of water to a boil over high heat. – While the water is heating up, heat a large pan over medium heat. Once hot, place the bacon slices in the pan. Cook until crispy, turning often (about 6-8 minutes). Remove bacon from pan and set pan, including bacon fat, aside for later use. -When water begins to boil, add beans and simmer for 3-4 minutes until tender. Drain water from pot. – Return the pan with reserved bacon fat to medium heat. Add garlic, sliced onion and green beans. Cook, stirring occasionally for 6-8 minutes, until beans begin to brown. -While the beans are cooking and the bacon has cooled enough to handle, crumble the bacon. -After beans have started to brown, add bacon, pistachios, raisins, oregano, basil and dill. Stir well and cook for an additional 2 minutes. Season with lemon juice, salt and pepper and serve!